The all-new premium offering from Suzuki — the “BURGMAN STREET 125” is now available all over Nepal. VG Automobiles, the authorized dealer for Suzuki motorcycles has recently launched the premium scooter in Nepal at Rs. 2,29,900. Yes, it looks big in size, inspired by its bigger sibling but that does not mean that the scooter is the maxi scooter which can go the distance with extra luggage. 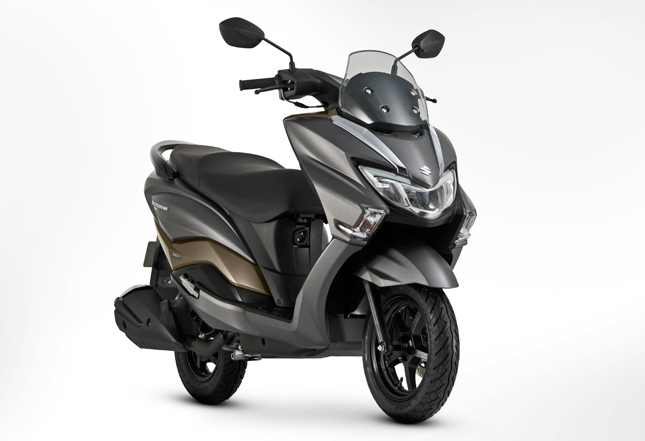 It is meant to look like the maxi scooter following the European market and to make it affordable it gets the 125cc engine with luxurious design. In the front, it gets the aero-dynamic design fitted with the big LED setup and position lamp which speaks the design language. Apart from that, the windshield, tail-lamp setup, chrome mirror, sporty exhaust muffler and chrome accent on front and rear parts make a complimentary for the overall design. It also gets the multi-functional instrument cluster from the Gixxer and offers easy leg position for comfort in long distance ride. The new BURGMAN STREET houses the same 125cc from the Access, which is a 4-stroke air-cooled engine with SOHC 2 valve single-cylinder BS-IV Engine that makes 8.7 ps @ 7000rpm, 10.2Nm @ 5000 rpm and is powered by the Suzuki’s SEP (Suzuki Eco Performance) technology, which results in good fuel-efficiency without compromising on power or performance. It now gets CBS with a disc on the front rather than the ABS. It gets 5.6-liter fuel tank with mileage of 53kmpl. The younger BURGMAN looks heavy but weighs less than the TVS NTORQ and equals the Aprilia SR which is 108kg. Apart from that, the scooter offers convenient dual luggage hooks in the front, 21.5L under seat storage, 2L gloves box along with USB port for charging and shutter key with central seat lock. The scooter is available in three color options: Glass sparkle black, metallic matt fibroin grey and pearl mirage white. Now that the scooter is here, it will compete against the premium offering from the Aprilia the SR 125 (Rs. 2,35,900) and the TVS NTORQ (Rs. 2,25,000). It might not be as fast as the SR and as smart as the NTORQ. So, it might stand in between them who want comfort riding with their leg stretched.